General scientific summary Local electric field distributions generated by transcranial direct current stimulation (tDCS) with an extracephalic reference electrode were evaluated to address the safety issues of extracephalic tDCS. We compared the maximum current density and electric field intensity values generated by six different electrode montages. Our simulation results demonstrated that the electric fields in the brainstem generated by the extracephalic reference were comparable to, or even less than, those generated by the cephalic reference, suggesting that the use of extracephalic reference does not lead to unwanted modulation of brainstem autonomic centers. via Evaluation of local electric fields generated by transcranial direct current stimulation with an extracephalic reference electrode based on realistic 3D body modeling. Wow! Check the article for the photo showing US Army use/placement of electrodes. They used magnetoencephalography MEG to record magnetic fields brain waves produced by sensory stimulation sound, touch and light, for example, while test subjects received TDCS. The researchers reported that TDCS gave a six-times baseline boost to the amplitude of a brain wave generated in response to stimulating a sensory nerve in the arm. The boost was not seen when mock TDCS was used, which produced a similar sensation on the scalp, but was ineffective in exciting brain tissue. The effect also persisted long after TDCS was stopped. The sensory-evoked brain wave remained 2.5 times greater than normal 50 minutes after TDCS. These results suggest that TDCS increases cerebral cortex excitability, thereby heightening arousal, increasing responses to sensory input, and accelerating information processing in cortical circuits. Remarkably, MRI brain scans revealed clear structural changes in the brain as soon as five days after TDCS. Neurons in the cerebral cortex connect with one another to form circuits via massive bundles of nerve fibers axons buried deep below the brain’s surface in “white matter tracts.” The fiber bundles were found to be more robust and more highly organized after TDCS. No changes were seen on the opposite side of the brain that was not stimulated by the scalp electrodes. 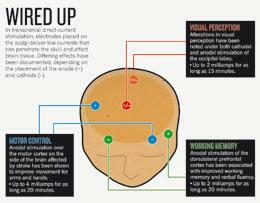 via Amping Up Brain Function: Transcranial Stimulation Shows Promise in Speeding Up Learning: Scientific American. via Transcranial direct current stimulation. 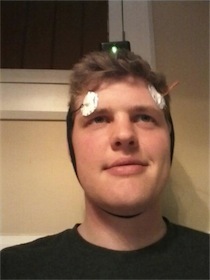 There seems to be a small community of DIY’ers trying out tDCS, for example /r/tdcs. How dangerous is jumping into something like this? This is obviously a fascinating topic, but I don’t really have the time to invest in learning electrical engineering and the ins and outs to feel completely safe, but I’m sure there are people out there that would. via Zap your brain into the zone: Fast track to pure focus : science. What if the mind-state attained by world-class athletes and brilliant physicists – the flow – were available to everyone, at minimal cost and without breaking any law? Would people go for it? We’re about to find out. The hottest new topic in brain research these days involves a technique called “transcranial direct current stimulation,” or tDCS for short.The setup couldn’t be simpler: Clamp a set of electrodes to the head, pass a miniscule direct electric current 2 milliamperes or less through the brain for 20-30 minutes, and presto, instant immersion in the flow state. The whole thing can be run off of a common nine-volt battery. via Could a Nine-Volt Battery Be Better than Coffee? – Casey Research. The 20 minutes I spent hitting targets while electricity coursed through my brain were far from transcendent. I only remember feeling like I had just had an excellent cup of coffee, but without the caffeine jitters. I felt clear-headed and like myself, just sharper. Calmer. Without fear and without doubt. From there on, I just spent the time waiting for a problem to appear so that I could solve it. It was only when they turned off the current that I grasped what had just happened. Relieved of the minefield of self-doubt that constitutes my basic personality, I was a hell of a shot. And I can’t tell you how stunning it was to suddenly understand just how much of a drag that inner cacophony is on my ability to navigate life and basic tasks. via Better Living Through Electrochemistry : The Last Word On Nothing. Other links in this article led to a clinic, more claims, and devices. Probably things are going to get murky quickly. Transcranial stimulation is simple and it includes two electrodes along with device running on a 9-volt battery to pass a stable current of 1-2 microamps constantly to form an electromagnetic field for modulating the neuron activity n the cerebral cortex. This device boasts a cathodal electrode as well as an anodal electrode, of which the latter is positively charged electrode while the former is negatively charged. When the switch is turned on, the current passes to the cathodal electrode via the anodal electrode, forming a circuit. 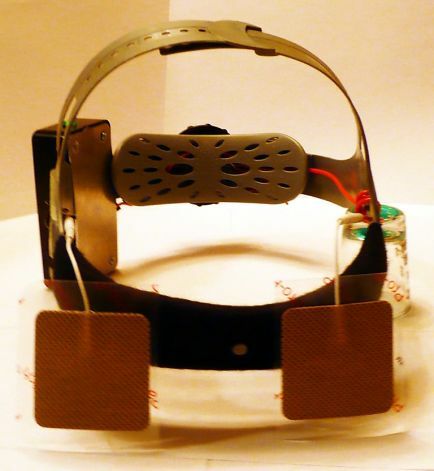 The batter-powered device also has controls for setting the current along with the duration of the brain stimulation. via Transcranial Direct Current Stimulation TDCS: Is it Effective for Treating Depression | Signs of Depression. Effects seen after the electricity is shut off can last for an hour or so and seem to arise from a second mechanism. Pharmacological evidence suggests that the current increases the expression of proteins called NMDA receptors at the synapses, the connections between neurons. This heightens the plasticity of brain tissue — leaving it in a temporary state somewhat like wet clay, in which it is more apt to reshape its synaptic connections in response to stimuli, such as when learning a video game. Researchers are exploring the ways in which this wet-clay state can be exploited. In a 2009 study6, Leonardo Cohen at the National Institute of Neurological Disorders and Stroke in Bethesda, Maryland, showed that tDCS improved people’s ability to learn a simple coordination exercise — and that the improvement was still apparent three months after the experiment ended. Such results have led to an interest in stroke rehabilitation strategies. Small trials by Cohen, Nitsche, and others have shown improved recovery of hand function when tDCS is used this way. via Neuroscience: Brain buzz : Nature News. 1 In this paper we demonstrate in the intact human the possibility of a non-invasive modulation of motor cortex excitability by the application of weak direct current through the scalp. 2 Excitability changes of up to 40 %, revealed by transcranial magnetic stimulation, were accomplished and lasted for several minutes after the end of current stimulation. 3 Excitation could be achieved selectively by anodal stimulation, and inhibition by cathodal stimulation. 4 By varying the current intensity and duration, the strength and duration of the after-effects could be controlled. 5 The effects were probably induced by modification of membrane polarisation. Functional alterations related to post-tetanic potentiation, short-term potentiation and processes similar to postexcitatory central inhibition are the likely candidates for the excitability changes after the end of stimulation. Transcranial electrical stimulation using weak current may thus be a promising tool to modulate cerebral excitability in a non-invasive, painless, reversible, selective and focal way. via Excitability changes induced in the human motor cortex by weak transcranial direct current stimulation – Nitsche – 2004 – The Journal of Physiology – Wiley Online Library. tDCS is one of the coolest pieces of health/ self improvement technology available today. The US Army and DARPA both currently use tDCS devices to train snipers and drone pilots, and have recorded 2.5x increases in learning rates. This incredible phenomenon is achieved through a very simple device called a tDCS machine.Today if you want to buy a tDCS machine it’s nearly impossible to find one for less than $600, and you are typically required to have a prescription to order one. We wanted a simpler cheaper option. So we made one. Then, because we’re all egalitarian like, we thought others might want one too.The GoFlow β1 is a full kit of all the parts and plans you need to build your own tDCS device. $99 will get you one of the first β1’s and will help us develop β2! “When you look at the brainwave patterns created by these machines, they are very similar to those a pro athlete would experience when they are in that state of flow,” Sornson says. It should be noted that Sornson studies marketing and not neuroscience, and the rest of his crew specialize in software and website design. “This machine will be designed for people interested in experimental use,” Sornson says. via GoFlow | Learn Faster. ► The accurate detection of concealed objects was an important skill during human evolution, and is required today for many forms of expertise. ► In this study, changes in brain function were examined as subjects learned to identify objects concealed in a naturalistic virtual environment. ► Brain networks found to be more active after training included frontal, temporal-parietal, medial temporal and cingulate brain regions. ► tDCS over right inferior frontal and right parietal cortex resulted in up to two-fold improvement in learning and performance. ► tDCS guided using neuroimaging may provide an effective method to reduce training time for a variety of complex skills. via TDCS guided using fMRI significantly accelerates learning to identify concealed objects 10.1016/j.neuroimage.2010.11.036 : NeuroImage | ScienceDirect.com. We performed a randomized sham-controlled study in which 13 subjects received sham and active bilateral tDCS delivered to DLPFC (anodal left/cathodal right and anodal right/cathodal left). For sham stimulation, the electrodes were placed at the same positions as in active stimulation; however, the stimulator was turned off after 30 s of stimulation. Subjects were presented videos depicting alcohol consumption to increase alcohol craving. Our results showed that both anodal left/cathodal right and anodal right/cathodal left significantly decreased alcohol craving compared to sham stimulation (p < 0.0001). In addition, we found that following treatment, craving could not be further increased by alcohol cues. via Prefrontal cortex modulation using transcranial DC stimulation reduces alcohol craving: A double-blind, sham-controlled study 10.1016/j.drugalcdep.2007.06.011 : Drug and Alcohol Dependence | ScienceDirect.com. Results: Smoking craving was significantly increased after exposure to smoking-craving cues (p < .0001). Stimulation of both left and right DLPFC with active, but not sham, tDCS reduced craving significantly when comparing craving at baseline and after stimulation, without (p = .007) and with (p = .005) smoking-craving cues. There were no significant mood changes in any of the conditions of stimulation. Adverse events were mild and distributed equally across all treatment conditions. Conclusions: Our findings extend the results of a previous study on the use of brain stimulation to reduce craving, showing that cortical stimulation with tDCS is beneficial for reducing cue-provoked craving, and thus support the further exploration of this technique for smoking cessation. via J Clin Psychiatry / Document Archive. The remote associates test (RAT) is a complex verbal task with associations to both creative thought and general intelligence. RAT problems require not only lateral associations and the internal production of many words but a convergent focus on a single answer. Complex problem-solving of this sort may thus require both substantial verbal processing and strong executive function capacities. Previous studies have provided evidence that verbal task performance can be enhanced by noninvasive transcranial direct current stimulation (tDCS). tDCS modulates excitability of neural tissue depending on the polarity of the current. via MIT Press Journals – Journal of Cognitive Neuroscience – Abstract.